I don’t usually serve chocolate cake as an after school snack, but it’s Friday and Fuzz has had a rough week so I decided to bake her a little cake using a recipe I found in my mom’s messy old binder o’ clippings. 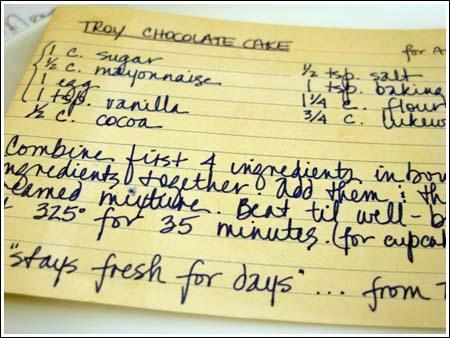 “Troy Chocolate Cake” was written on a loose index card in handwriting that looks very much like my aunt Dianne’s. Then again, I am not exactly sure why she would put my mom’s name on top of it so it might have been written by someone else…. But many thanks to the person who wrote this down! We loved it. Here’s the recipe as written on the card. An easy chocolate cake made with mayonnaise. Combine first 4 ingredients in bowl. Sift dry ingredients together. Add them & the water to creamed mixture. Beat till well-blended. Bake at 325 degrees (I used an 8 inch square pan) for 35 minutes. For cupcakes, bake at 350 degrees for 15 minutes. To make the frosting, melt the butter and place in a microwave safe bowl. Add the cocoa powder and stir until smooth. Add the confectioner’s sugar and sour cream alternately to the chocolate mixture and beat until fluffy. Beat in the vanilla. 1. I baked it in an 8 inch square metal pan. Only one bowl is required for mixing and I didn’t need an electric mixer for the cake batter. 2. If you make the frosting, you will need the electric mixer. Even with the mixer, mine had a few lumps, but it was great frosting. 3. Since the recipe calls for baking soda and no baking powder, I used natural cocoa, which is more acidic than Dutch process. Dutch process might work, but the natural was excellent. Thanks so much for trying the recipe, and I’m glad you enjoyed it. Happy belated birthday to your husband :). The cake I baked for my husband’s 69 Birthday was exactly as pictured, and quite rich and moist. We thoroughly enjoyed it. Thank you for sharing this recipe. I have been baking this cake for over 30 years. I first saw the recipe on my utility bill. A person from Troy, N.Y. submitted it. It is wonderful even without icing, and freezes well. I made this for Father’s Day. It was easy to make and turned out really good. Very moist, and a little dense in a good way. I made a different frosting to fulfill a request for white frosting. Thanks Anna! I loved it and your so cute it so good I had a party at school me and my mom made it and every body loved it very much and can I have your phone number please Troy. Maybe chocolate sour cream icing is a love it/hate it sort of thing? Who knows. Ours turned out really good. Another thing that can ruin perfectly good icing is using old powdered sugar or sugar that’s absorbed flavors from somewhere else. A hole in the box or partially opened bag can ruin powdered sugar. And I can’t believe anyone wouldn’t love the chocolate sour cream frosting. THat’s my go-to chocolate icing, so good! Hi Anna, I have never seen mayonnaise used in a cake before, but if Fuzz liked it, it must be good. Wow! I don’t remember any after school snacks like this! Well, first off, I went back to the binder and found some more recipes with the same handwriting — Honey Ice Cream and Summer “Creme” Pie. I’m fairly certain the recipes are from my aunt, who lived in New York and would likely have a recipe from Troy. She must have written out multiple cards and wrote names on cards to keep track of which ones were for who. Jenny, my husband hates mayonnaise too — but not in cake! I’ve made mayonnaise cakes before, but the ones I’ve made used mayonnaise in place of eggs. This one is interesting in that it also includes the egg. Charley, maybe it appeared in a Troy newspaper? It would be interesting to know just why it’s called “Troy Chocolate Cake”. And I have to admit, I always thought mayonnaise cakes were Southern thing. Cathering, I must have too much time on my hands today because I have also been trying to figure out what “cat paw, lemon, on the way to church” means. Michelle, I picked this frosting recipe at random because it seemed easy and I had some sour cream. It was definitely a good pick. That looks yummy! 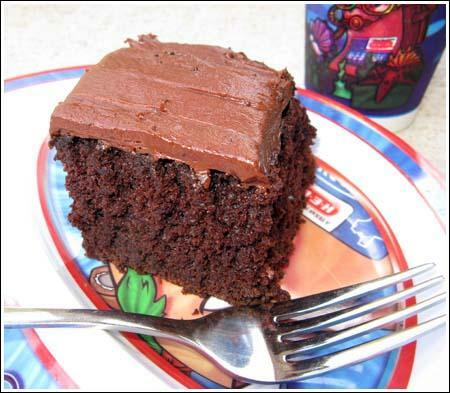 I always put mayo in my chocolate cakes….and that’s my fave Cake Mix Doctor frosting. Love those books! I just love the stories behind the faded recipe cards. My grandmother left such cryptic messages on hers…I’m still trying to figure them out. What do you think “cat paw, lemon, on the way to church” means??? This recipe looks very similar to the chocolate mayonnaise cake that was given to my mother by my old school bus driver. I grew up only 40 minutes from Troy so I’m curious about the origination of the recipe. Thanks for reminding me of this treasure. This reminds me of the first of a lovely series of plays they had on radio 4 on the bbc which I listened to on the internet. They made a sort of revenge cake with a whole jar of mayonnaise in as the husband hated mayonnaise and it turned out to be wonderful! Certainly looks very moist!